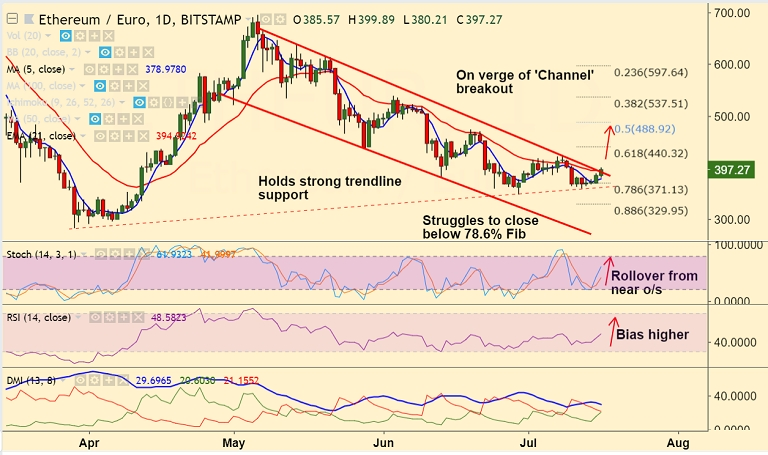 ETH/EUR is on verge of 'Channel' breakout which if completed will see further upside. The pair finds stiff resistance at 21-EMA at 395, decisive close above will add to the bullish bias. Technical indicators on intraday charts are turning bullish. The pair is holding 5-DMA support. Price action has bounced of major trendline support and has failed to close below 78.6% Fib. RSI is biased higher and Stochs have rolled over from near oversold levels. Breakout at 'Channel Top' raises scope for test of 61.8% Fib at 440 levels. Rejection there could see resumption of downside. Scope then for test of 88.6% Fib at 329. Recommendation: Good to stay long on decisive break above 395, SL: 375, TP: 420/ 440/ 470.